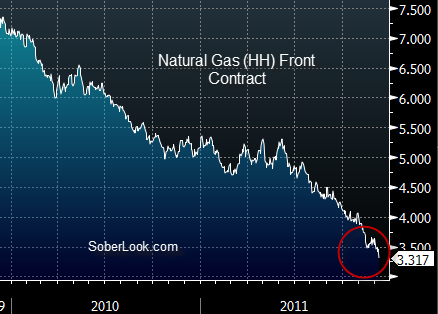 Looking back at a two year old post on natural gas called "Natural gas prices below zero? 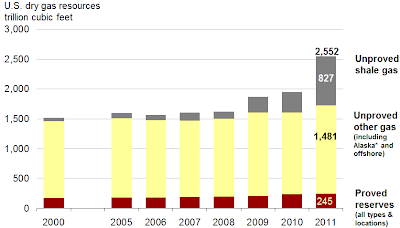 ", it feels as though we are back to the same price dynamics. Price for the "nearby" Henry Hub contract hit new lows today at $3.317/mmBtu. What is driving this price collapse? As before it is the usual suspects: limited storage, strong production (particularly in US shale), increasing reserves, and warm weather. Let's take a quick look at the first three. 1. Storage: The chart below compares current storage usage versus the historical range based on where we in the seasonal cycle (inventory drops off in the winter and increases the rest of the year). Just as in 2010 and 2009 we are at the top of the range and may go even higher if the weather in the NE & Midwest stays warm. 2. Production continues at rates significantly above historical levels. This growth is driven by a rapid increase in shale gas production. 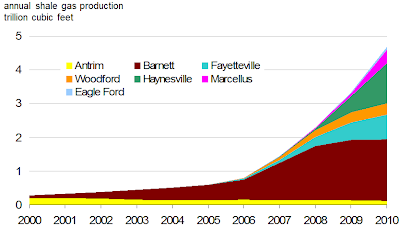 According to EIA, the US shale production increased 14-fold since 2000 and is now 22% of total US production. 3. 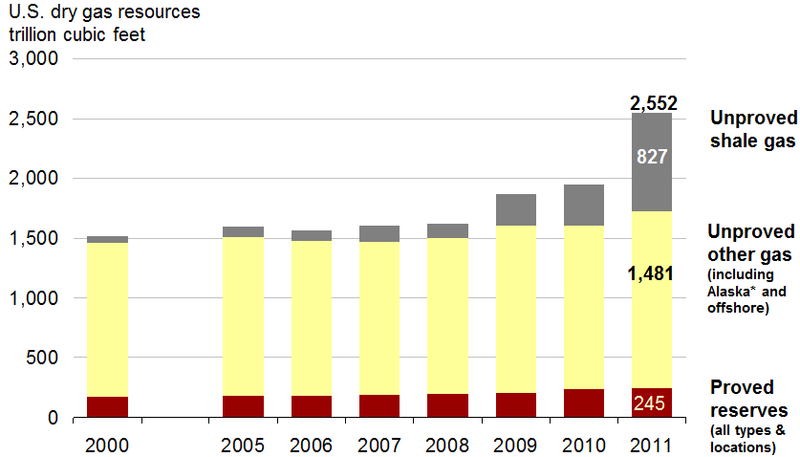 And estimated reserves in the US continue to increase. It is almost as though the US is becoming the Saudi Arabia of natural gas but with limited export capabilities. 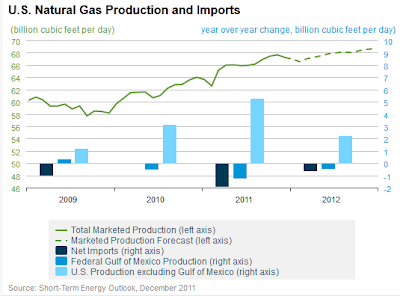 No real support for natural gas prices is expected to come until 2013. According to a Goldman report this support will come from moderation in production growth and environmental restrictions that will force conversion from coal burning to natural gas. Until then if the weather stays warm, there is no telling how low natural prices could drop.